Newcastle United are hoping to tie up a move for West Bromwich Albion striker Salomon Rondon in an initial loan deal, according to reports last night. The Magpies have made the Venezuelan striker their No 1 target this summer as Rafa Benitez looks to add firepower to his attack. Rondon has a clause in his contract which enables him to leave for £16.5million after West Brom's relegation from the Premier League. However, Teamtalk have claimed that Newcastle are prepared to offer the Baggies a £4million loan fee for the 28-year-old, and will then pay an extra £15million to make the deal permanent next summer. Rondon, who scored just four Premier League goals last season, has just a year left on his contract. 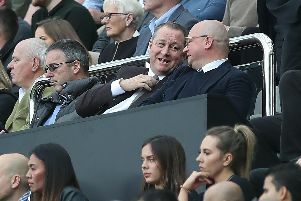 Newcastle owner Mike Ashley has so far baulked at the overall fee involved for Rondon, including the cost of his contract and agent fees which which would send the transfer spiralling over £20million, with the Magpies unlikely to recoup any of that. However, Benitez is determined to make Rondon the focal point of his strikeforce for the coming season.